BC Premier Christy Clark took a break from bullying teachers yesterday to back the idea of elections to Canada’s Senate. If the private member’s bill introduced by Liberal John Les passes through the Legislature, which with the Premier’s support it almost certainly will, British Columbians could wind up voting this fall on the replacement for retiring Conservative Senator Gerry St. Germain. The problem with Senate reform is that it places a veneer of legitimacy over what is a fundamentally unjust institution. 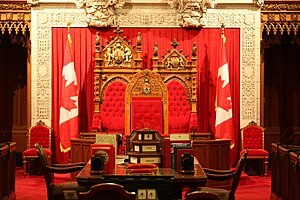 Elected or appointed, the Canadian Senate will always be based on the formula of representation by region or province rather than representation by population, and thus will violate the cardinal democratic principle of one-person-one-vote. Yes, the status quo where we hand a veto over all our legislation to a body of basically lifetime patronage appointees is wrong, but that doesn’t make any and every change right. Senate elections will resurrect the chamber’s tattered image, and embolden it to challenge more bills passed by the House of Commons. Short of abolition, I would rather have an appointed but mostly ineffective unjust institution than an elected and effective one. But isn’t a strongly bicameral legislature an important check on government power? I would say that the checker must be at least as democratic as the checkee. If, however, we as a society judge a second house of Parliament to be vital to our system of government, then perhaps we can consider other forms of a more participatory nature. Both BC and Ontario have in the recent past made use of citizens’ assemblies to examine options for electoral reform. Why not set up such a body on the federal level — not just to deal with a single issue but as a permanent feature of our democracy. Structured so as to represent Canadians proportionally by such demographic criteria as region, gender, ethnicity, class, age, and sexual orientation, a national citizens’ assembly could start out with a mostly advisory role, and then take on increasingly more power once the country becomes accustomed to its operation. But in the meantime, what to do about the Senate election possibly coming to BC? Those of us who favour abolishing the Senate have a choice. We could boycott the election as a matter of principle, or we could just accept that the battle is lost and reluctantly add Senators to the list of people we vote for. A boycott carries the obvious risk of delivering victory to the worst of the worst (probably another Conservative). Perhaps the best possible outcome would be for some enterprising candidate to run on the pledge to try to abolish the Senate from within. I for one could scarcely resist voting for such a person — even if it means sullying myself by coming into contact with the notorious Red Chamber through the ballot box. This entry was posted in BC Politics, Canadian Politics, Democracy and tagged bicameralism, Christy Clark, citizens' assembly, Gerry St. Germain, John Les, Liberal Party, Senate, unicameralism by David Taub Bancroft. Bookmark the permalink.